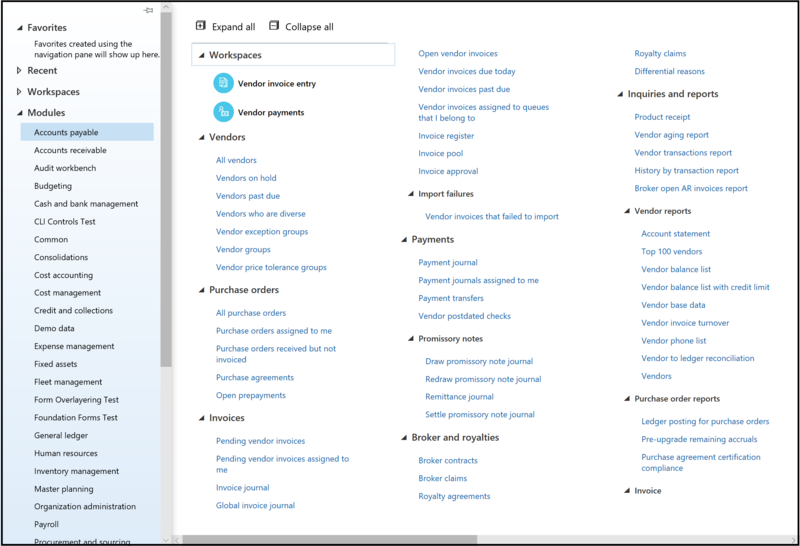 The navigation pane is a highly used navigation mechanism in Finance and Operations that provides access to favorites, recently opened pages, workspaces, and the main menu. Because of its high usage, the navigation pane has been enhanced in a few ways to improve its usability. These changes are available starting in Platform Update 22. Targeted styling changes have been applied to the navigation pane to better distinguish the different hierarchical levels in the menu structure and to make workspace tiles fit better visually inside the menu hierarchy. 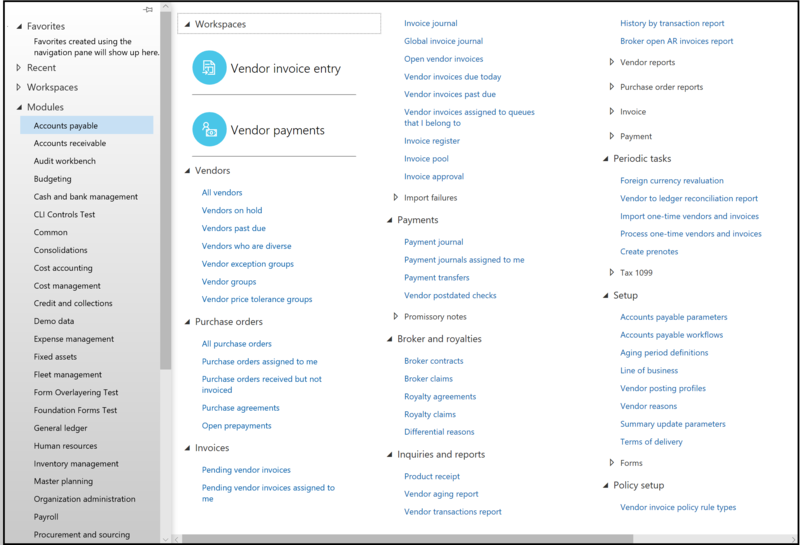 For example, the following image shows the navigation pane in Platform Update 21 and earlier. Notice that the workspace tiles take up a lot of room. 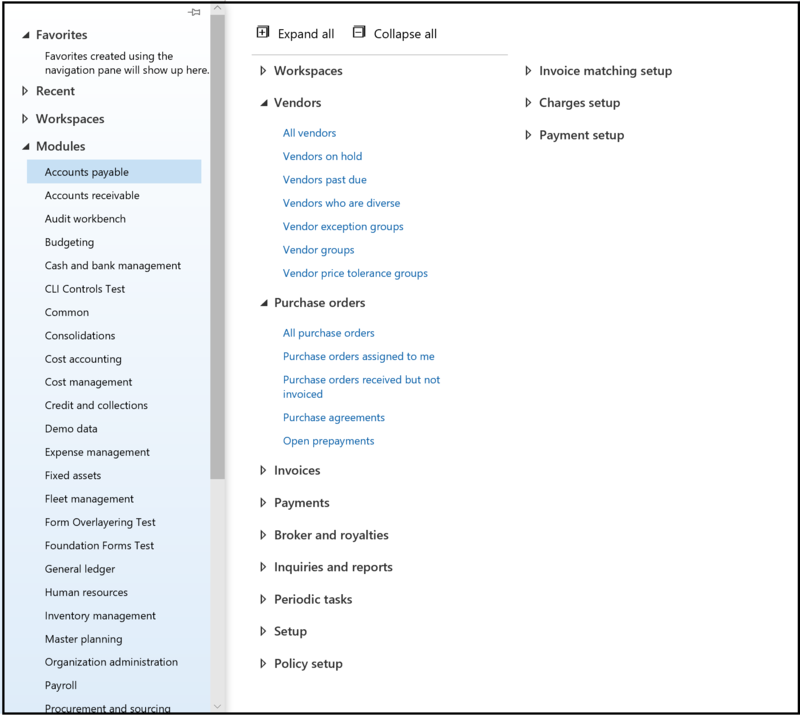 The following image shows the navigation pane in Platform Update 22. Notice that the workspace tiles fit better. To make our module menus more approachable and less overwhelming to users, we are now starting each user off with almost completely collapsed module menus; only the Workspaces folder is expanded by default, as shown in the following image. Expand all and Collapse all buttons have been added to the top of each module's menu to allow users to fully expand or collapse the menu with a single click. The Expand all button is particularly useful for browsing scenarios where users aren't exactly sure what they're looking for, but would like an easy way to see the full module menu. The Collapse all button lets users quickly return to a base starting point. The most exciting enhancement to the navigation pane is that the system now remembers the expand/collapse state of each menu, so that the next time you open a module, the menu will be in the same state that you left it in. This allows users to keep the folders they never or rarely use collapsed all the time, while at the same time the folders with links they frequently use stay expanded. 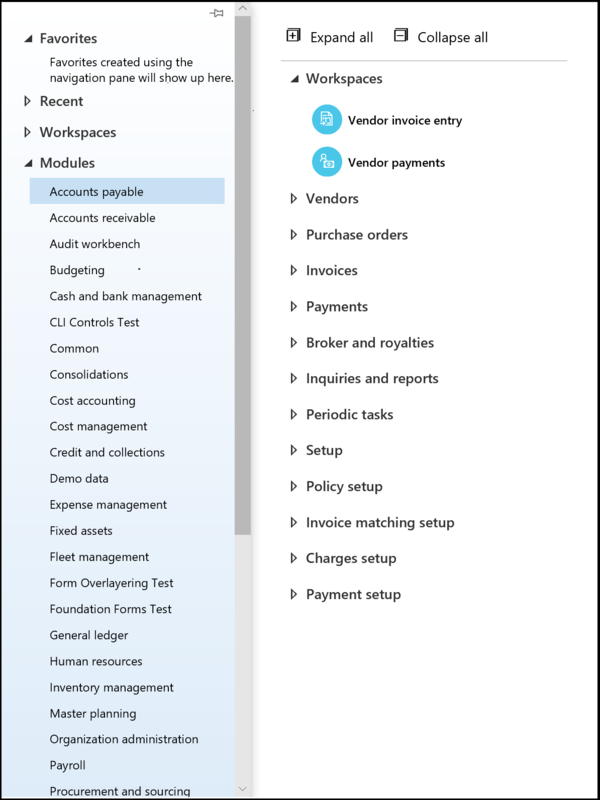 For example, if the Vendors and Purchase orders folders contain the menu items you use most often, you can expand those two folders, and they will be expanded for you the next time you open this menu.